Still Life with Fruit is considered one of the artist’s most outstanding paintings, produced at the height of her career. In contrast to her earlier compositions, which were simpler and made less elaborate use of lighting and colour, this canvas displays a more sophisticated structure. The light is heavily focused on the objects at the centre of the work, creating strategic shadows that add background depth, while the rich chromatic subtlety and harmonious arrangement of colour enhance the balance of the composition as a whole. 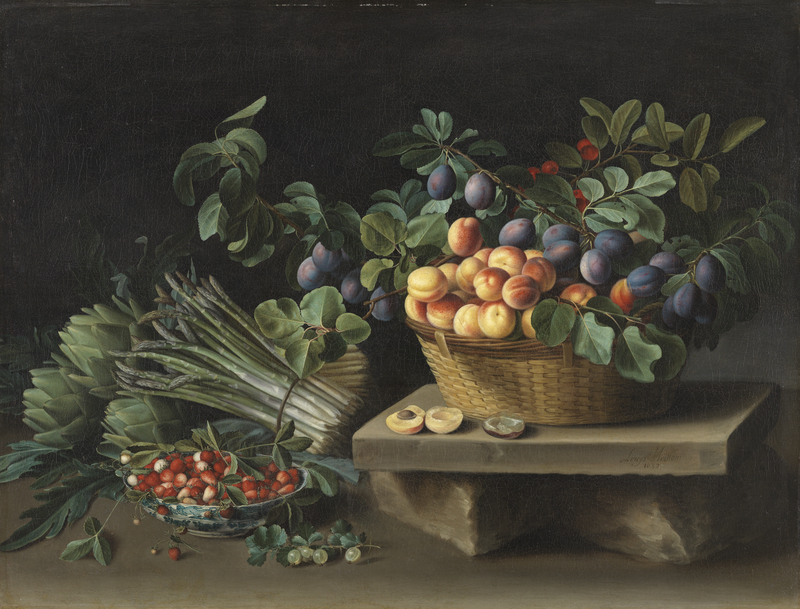 In this still life, not only the spring vegetables and fruit—artichokes, asparagus, strawberries, plums and apricots—but also the greenery is rendered in meticulous detail. In the left foreground is a Chinese bowl with strawberries, a loose stalk of strawberries at its side and a bunch of red-currants. Behind to the left are three artichokes and two bunches of asparagus. In the right half of the painting is a ceramic dish leaning on two rather rough bricks. In the dish is a basket of apricots, strawberries and cherries. In front of the basket are three apricots cut in half, one of them still with its stone. The objects are enclosed in the upper part of the painting by a green vault which ingeniously reproduces the different textures of the front and back of the leaves of the different fruits, each with its characteristic forms, and of the asparagus and artichokes painted with strong contrasts of light and shade and in a wide ranges of shades of green. The fruits are also painted with great chromatic subtlety and the overall arrangement of the colours is extremely harmonious, with the entire composition expressing balance and great serenity. The light coming from the left mainly focuses on the apricots in the basket without any strong outlines. Pronounced shadows give the background depth. Louise Moillon's painting went through a radical change in the years 1629 to 1637. At the outset of her career, the artist painted simple and symmetrical compositions in which the table was viewed from above and was arranged with separately placed pieces of china, baskets of fruit or other objects, using very little greenery and with a flat lighting and undelineated tones. 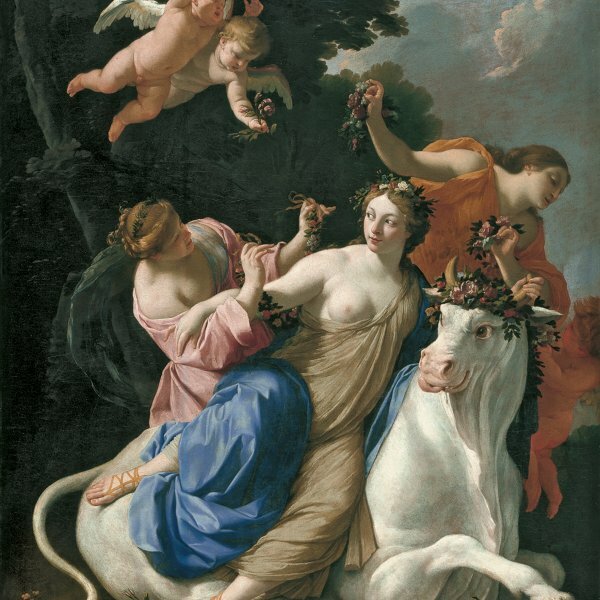 Her work from 1637, however, features paintings of refined structure in which the objects are superimposed in a natural manner, the greenery acquires an important decorative function, the colours are rich and the lighting more or less focused. The present painting is a key work within this evolution. It can be related most closely with a simple composition of 1636 of a basket with grapes and peaches on a stone plinth supported on two bricks. 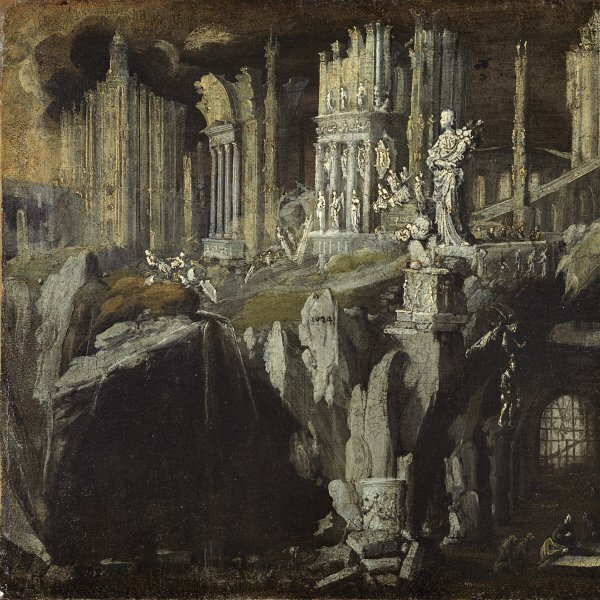 Moillon's later dated works show a notable falling-off in skill and aesthetic sentiment. The present painting probably has no particular hidden meaning, however, it is possible that such a meaning exists in a series of the artist's early works. One might conclude this from the presence of insects on her paintings until 1631: these often had a symbolic function which may have become something of a cliché. Two large market scenes with fruit of 1621 and 1630 may, however, suggest a different interpretation. The fruit is shown on a large table in humble baskets and in a valuable Chinese tray. In the centre foreground of both paintings is a large curling apple skin which hangs from the edge of the table with a fly on it, and also a small skin with a fly. Some apples in a large basket show signs of rot, while there are also flies among the apricots and in the plums. From a ledge in the middle-ground hang a bunch of grapes and behind and to the right are cherries surrounded by chestnut leaves in a basket. The rotting apple skin and a fly on a tabletop is a motif found in the work of the Dutch painters Floris van Dyck and Nicolaes Gillis in their work of 1610 to 1622. In a modified form in which the skin is still attached to a partially-seen piece of fruit, it is found in the work of another Haarlem painter, Pieter Claesz, of 1622. Later the decorative function of this motif would be replaced by a lemon skin, usually still attached to part of the fruit, as deployed by a large number of artists. In the paintings of "displayed meals" by Van Dyck and Gillis we see the table from above and the objects isolated, as in Moillon's paintings. These works by the Harlem painters probably include a moral meaning: the spectator is offered the choice of good and bad. In this way the apple is often seen as the fruit of the Tree of the Knowledge of Good and Evil in Genesis. The Latin word Malus also means bad. The fly is a symbol of corruption, while the apricots, plums and asparagus are often understood as symbols of the pleasures of the senses. The grapes, cherries and strawberries were symbols of Christ, all the more given that in the Eucharist wine represents the body of Christ, while the cherries represented His red blood and the strawberries, as the first fruits of spring, were a symbol of the Resurrection.